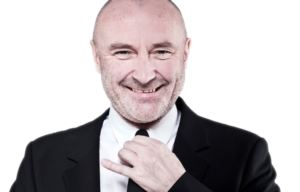 Phil Collins embraced his weirdness and it paid off handsomely for him. Phil Collins has certainly led an interesting life. I was born in 1984 and by that time we were just about at Peak Phil Collins in the ’80s. But I remember that for most of my life I’ve always liked his music. He was a pretty steady presence on pop ready through the ’90s and also on Adult Contemporary channels into the 2000s. He’s obviously well known for his solo career, but also with his mega successful band Genesis. I found the book to be a great read. Phil didn’t seem to really hold anything back. I hadn’t really realized how much he’d struggled with pain pills and alcohol in recent years. He just told his story as he views it and there were some really good lessons on life and business that I puled out. Phil got a drum set when he was just a young kid. He fell in love and worked and worked while his fingers bled and bled. He loved it and it wasn’t work for him. He knew he wanted to drum. So we’re talking about years and years of putting in time and during his late teen years Phil was getting a little frustrated. He had been in bands, but he wasn’t really getting his breakthrough. Then he latched on with Genesis and even that was more of a slow burn and they really started hitting their stride in the mid 1970s. Collins was frustrated, but he never really entertained the idea of quitting. He was going to figure it out. To me, that’s the number one rule of business and entrepreneurship. Don’t give up. Why would you? What’s the worst that could happen? Phil spoke about being nervous when he was an actor in theater as a child. He spoke about being nervous playing drums in front of people for the first time. Then he really got nervous when he became the singer in Genesis. Then he went solo and had to figure that out and he was very nervous. Then he got into scoring movies and creating songs for Disney and that was nerve wracking. And later in life he spent time away from music and when he came back he was nervous. The key here is that doing new things or even things we think we do well can make us nervous. Everybody gets nervous. If you can embrace the nervousness and accept it you can still accomplish great things. And here’s a tip: no matter how nervous you are inside the people watching you really can’t tell. They really can’t. Phil Collins went through a lot of change in his life. Just as Genesis was starting to find momentum their lead singer left. Then another member left. So they quickly went from five to three just as they were finally starting to break. But then once it was just three they found more success than they ever had. They seemed to embrace the change. They knew that it was part of life and they focused on what they could control and they made the best of it. Not everybody embraces change. But those that do usually find big opportunities. It seemed that Phil Collins had a weirdness about him. People thought he was a weird kid. He was creative. He dressed strangely and all that stuff. An admirable thing was that Phil embraced it throughout his life. He let himself get weird and that led to some of his most creative efforts. He knew that some of the songs he created weren’t by the number. They weren’t things that people expected, but they often became big hits. Creativity often comes when we let our guard down. As we get older it seems that we suppress our inner weirdness. We’re afraid of what others will think. They’ll think highly of you if you get weird and do something that’s fresh. Even in the early days Phil didn’t really say no to many people. He did say no in some instances, but he was always listening and looking for opportunity. That seems obvious, but I don’t think we all train ourselves to recognize opportunity. I think maybe it goes back to the fear of change. We fear change so we don’t let ourselves even see opportunity. Phil found opportunity with Genesis. Then in his solo work he got offers to work with other artists. He was able to venture into movies and all kinds of things. He seemed to have fun doing that. He liked being challenged. And when he found opportunities that appealed to him he was usually successful. Not always, but more often than not it seemed. Phil Collins seemed to love working with others. He obviously had success on his own, but he would tell you that even in his solo career that he worked with some great people. Phil produced other artists. He was in a band. He loved the label head at his record label. It’s difficult to do things on your own in this world. It’s good when others are invested in your success and want you to succeed. Phil seemed to really get that. There was some backlash in later years against Phil and his music. Some didn’t understand it. Some thought it lacked substance and all kinds of things. Maybe when you reach a certain level people just want to pick you apart and break you down. That will get to just about anyone including Phil. But he seems to be very proud of the music he’s made. Throughout his career he’s been good at trusting himself. He does what he thinks is right and he’s confident in those decisions. It’s proven to be a good way to live for him and for many others. It seemed like Phil was a pretty good guy for the most part. He had struggles with marriage and relationships in his personal life. He said he wasn’t above having a temper. But Phil also seemed like he wasn’t one to burn bridges purposely. He could have left his bandmates when he made it big as a solo artist, but he didn’t burn that bridge. It’s easy in life to want to “get back at” people or whatever if you think they’ve done you wrong. But why burn bridges? Forgive and move on and usually things might come back around as opportunities, but only if you leave bridges still standing. Phil seemed to appreciate fun and pleasure. He surely had his down moments, but he really seemed like a fun guy. This life really isn’t that long if you think about it. Obviously we can’t be happy all the time, but why would we want to be sad for much of it? Enjoy the things you have instead of focusing on the things you don’t have. Toward the end of the book Phil discussed his struggles with addiction. The interesting thing is that for most of his life it seemed like he didn’t really get involved with vices. Sure, he got drunk occasionally. There was an early incident on stage, but he really seemed pretty clean cut during his peak. Then toward his later years he kind of left music and the vices replaced all that work. Phil looked back and looked forward and realized that he is a man of action. He likes doing things. He needs to do things. And he has a choice of what he can do. He knows now that if he doesn’t look for positive activities that he’ll fall prey to vices. The more we know ourselves and our tendencies the better we can live our life. I think we can always look to learn more about ourselves. We can be mindful of ourselves. We can ask others for their thoughts on how we live. We know Phil Collins for a lot of great music. He really kind of came to define pop music in the ’80s in a lot of ways. But he led a really interesting life. He was a successful musician and I’ve always thought that musicians are a lot like entrepreneurs. Hopefully some of these lessons can inspire and motivate you. Maybe you can pull something from this information that I haven’t seen. Either way, I really like looking at people’s lives and learning more about how we can live successful lives.